[SatNews] Talia, a major supplier of satellite Internet for Africa, the Middle East, and Europe announced the successful launch of Arabsat's newest satellite, Arabsat 5A on July 2nd. With significant capacity for both Africa and the Middle East, Arabsat 5A provides a new and powerful platform for Talia customers throughout all of Africa, the Middle East, and Central Asia. Arabsat 5A, a multi-mission satellite, will operate at 30.5 degree East to increase satellite communications and broadcasting services over sub-Saharan Africa, the North-Africa and Middle East region, and beyond. Launched on 27 June 2010, by Arianespace in French Guyana, Talia will offers dedicated services, trunking, and the complete host of iDirect services on Arabsat 5A, including VNO and private network options. 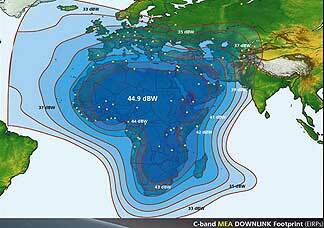 Arabsat 5A joins Arabsat BADR-6, and Ku-band services on Telesat T11N to enhance Talia's African service portfolio and NSS-12 and Telstar 12 in the Middle East.